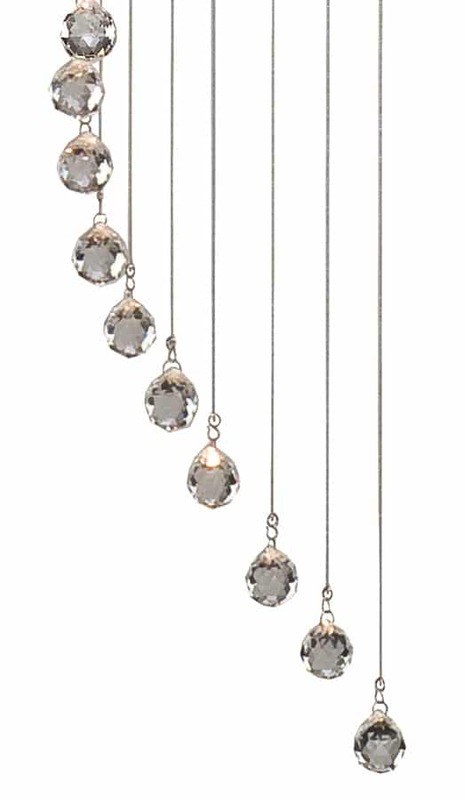 A large polished chrome ceiling mount containing five GU10 LED spot lamps that direct the light downwards, through the spiral faceted crystal balls suspended on wires. This is a large scale feature light pendant with a 180cm drop, well suited to large hallways, stairwells or vaulted ceilings. Please note that this light fitting requires the use of LED GU10 lamps with a 30,000 hour lamp life (not supplied) making it perfect for areas of restricted access. Suitable dimmable LED lamps can be found by following this link. Please note that the ceiling mount has a diameter of 300 mm.